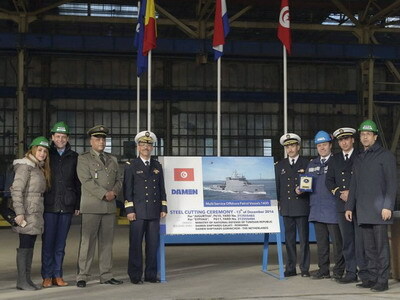 Damen Shipyards Galati is busy with the construction of the first two Multi Service Offshore Patrol Vessels (MSOPVs) for the Tunisian Navy, the company has revealed. The Romanian shipyard on 14 December published a photo via Facebook of a steel cutting ceremony that took place on 13 December for the MSOPV 1400 Jugurtha (P610) and Syphax (P611). According to IHS Jane’s Defence Weekly, another two offshore patrol vessels (Hannon and Sophonisbe) will be built for the Tunisian Navy, with all four scheduled for delivery by the end of 2018. The MSOPV is Damen’s second generation offshore patrol vessel design and was revealed a couple of years ago. It incorporates Damen’s Sea Axe hull shape for superior seakeeping – since the hull is designed to reduce water resistance, the new OPV is fuel efficient and capable of speeds up to 25/26 knots, Damen said. A Multi-Mission Bay can be equipped with dedicated mission modules (e.g. mission containers) for missions such as counter piracy, counter-drug operations, anti-mining warfare (AMW), search-and-rescue (SAR) etc. The Multi-Mission Bay is also equipped with a nine metre RHIB (rigid-hulled inflatable boat), which can be launched over a dedicated slipway through the rear of the vessel while the OPV is sailing. The command-and-control centre is located directly behind the bridge. Damen calls this development their Multi-Mission Bridge. Both spaces can be separated by means of a blinded sliding wall. The Multi-Mission Hangar is capable of storing an 11-tonne NH-90 helicopter and an unmanned aerial vehicle (UAV) such as the Boeing ScanEagle. The hangar has been designed so that the OPV crew can deploy either the helicopter or the UAV without having to move either one. The second generation Damen offshore patrol vessel is available as a standard in four sizes: 75 meter (1400 tonnes), 85 meter (1800 tonnes), 95 meter (2400 tonnes) and 103 meter (2600 tonnes).